Iraqi forces are advancing into western Mosul and making steady gains in efforts to liberate the area from the Islamic State of Iraq and Syria, the spokesman for Combined Joint Task Force Operation Inherent Resolve said today. 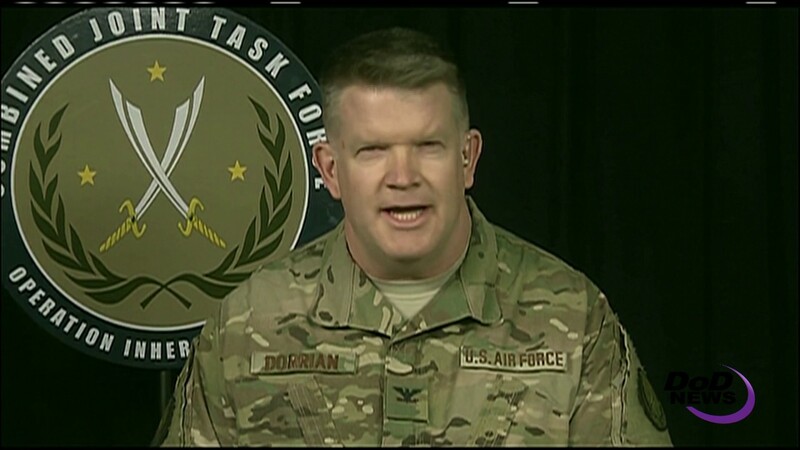 The ISIS-controlled area is "shrinking steadily with each passing day," Air Force Col. John Dorrian told Pentagon reporters in a news briefing from Baghdad. "The main effort is to isolate the remaining enemy remnants in the west part of Mosul," he said, noting the terrorists will "either surrender or they're going to be killed there." Iraqi forces have encountered moderate resistance in their approach, Dorrian said. The coalition continues to pound ISIS targets in precision strikes, destroying 23 ISIS mortar and artillery pieces in the first three days of operation, he said. That is setting the conditions for Iraqi forces to retake the Mosul airport and begin moving toward more dense urban terrain, the colonel said. 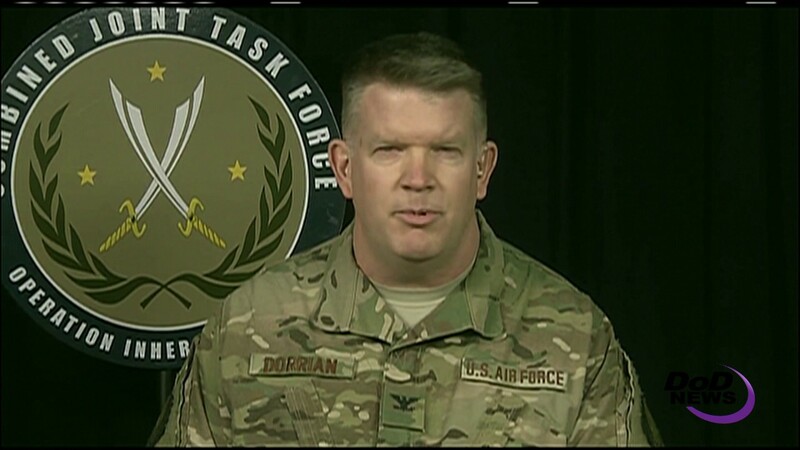 "Conditions have been set for ISIS's defeat through their significant effort to reduce their command and control, their weapons and their financial resources," Dorrian said. He commended the Iraqi forces for their progress, but noted they have a number of challenges ahead of them. Those challenges include the tedious and extremely dangerous task of clearing each of the more than 100,000 buildings in west Mosul, Dorrian said. The narrow streets in the oldest parts of the city will make it difficult for the Iraqis to move their vehicles, he said, but that also means the terrorists will not be able to move vehicle-borne explosive devices. "We do expect it to be an extraordinarily difficult fight," Dorrian said. Part of efforts to defeat the terrorists is to "take every opportunity that we can to remove ISIS leadership figures from the battlefield," he said. A coalition precision airstrike Feb. 13 in Mosul killed Haqi Ismail Hamid al Emri, a legacy al-Qaida in Iraq member who had a leadership role in ISIS security networks in Mosul, Dorrian said. Additionally, he said, precision strikes in January in Mosul killed Abu Abbas al Qurayshi, who coordinated the movement of vehicle bombs and suicide bombers inside Iraq; and Abdullah Yasin Sulaymani al Jaburi, who was responsible for anti-aircraft defense assets within Mosul. Syrian Democratic Forces continue advancing from the north and east of the key Syrian city of Raqqa, Dorrian said. Coalition partners on the ground in Syria have liberated more than 300 square miles and more than 100 villages since Feb. 4, when they began reclaiming and clearing the land east of the city, he said. "We're now seeing signs that ISIS fighters [and] its leaders in Raqqa are beginning to feel the pressure," he said. They are becoming "increasingly paranoid" and have intensified measures to control the population and destroy televisions, mobile phones and satellite dishes in order to maintain control of access to information about their losses, he said. "These are not the actions of an enemy who feel they're winning," Dorrian explained. In addition, he said there are reports of ISIS executing fighters who try to abandon the fight or are suspected of collaborating with forces trying to liberate the city. ISIS leaders are also reportedly moving their own families out of Raqqa, but detaining civilians who attempt to flee, Dorrian said.